“Help me to do it by myself”….the words of a Montessori child. Over 100 years ago Maria Montessori recognized the preschool years as the foundation for a lifetime of learning for the child, indeed for the very person the child will become as an adult. The vital importance of the work of the child during these years led her to develop a philosophy and method that are now used in preschools all over the world. 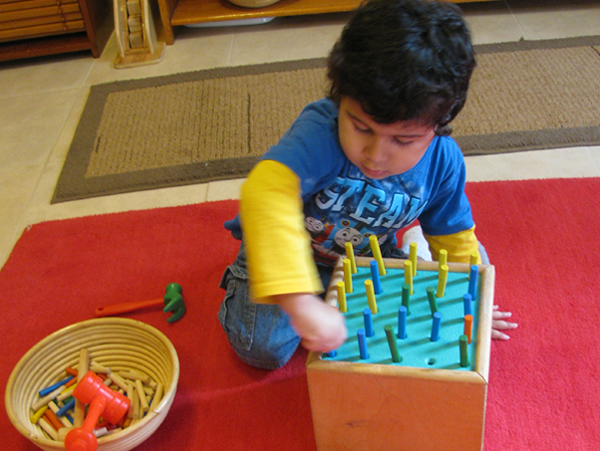 Montessori observed that the child learns best through the work of the hand, through the senses, and through movement. 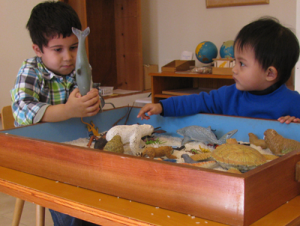 The Montessori preschool environment is carefully prepared with sensorial, manipulative materials used to teach the curriculum. The teacher guides the child with lessons in how to use the materials and the child is then encouraged to choose purposeful work, giving them the opportunity to follow their inner guide, making the learning experience individual to each unique brain. Practical life activities such as washing a table, sweeping the floor, cutting a carrot, pouring water, and sewing teach the young child to be independent and responsible. In addition, they develop control of movement, concentration, eye-hand coordination, and self-confidence, skills and qualities necessary for learning in every area of the curriculum. The young child has a special sensitivity to learning language and math concepts. The Montessori environment is rich in materials designed to allow the child to explore these areas as she becomes interested and ready. They also provide a solid foundation for the elementary years. The cultural subjects of geography, plant and animal study, and science experiments are of great interest to the child. These subjects are explored outside and inside the classroom through activities such as puzzle maps of the continents, classroom animals, clay and water landform construction, and nature walks in the beautiful grounds surrounding the school. Lessons on grace and courtesy help the child develop respect for their self and others. These lessons may be as simple as how to open and close a door quietly or how to greet a visitor and introduce oneself. Art and music activities are woven into all aspects of the classroom life with songs, instruments, story illustrations, lessons on learning art skills such as cutting and painting, and the sensorial bell material.